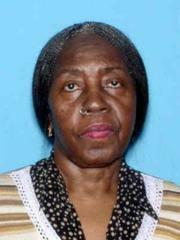 Missing Person: Mildred Buggs, 76, BF, 5'-6", 170 lbs. Last seen: Newark, N.J., on 8/17/15. Mildred Buggs, 76, black female, 5'-06", 170 pounds, brown hair, brown eyes, grey, black hair, was last seen in the area of downtown Newark, N.J., on August 17, 2015. She was last seen wearing a lavender-colored jacket, tiger print shirt, and a black skirt. She was initially reported missing from her home in Plainfield, N.J., on August 5, 2015. She may possibly be headed to Treemont Avenue, East Orange, N.J. Anyone with information is asked to contact the New Jersey State Police Missing Persons Unit at 609-882-2000 ext. 2554 or Plainfield Police Department at 908-753-3360.